Our year 10 and 11 students spent an interesting day taking part in workshops as part of our Spiritual, Moral, Social and Cultural (SMSC) programme. With Year 11s approaching their GCSEs, and Year 10’s not far behind them, the themed workshops were designed to help students consider the next steps after exams and help strengthen their employability skills. Our Year 10 students took a day out of their usual timetable, having a set of different lessons that follow our SMSC programme. They explored a whole host of British values including democracy and tolerance. Year 11 were joined by four external organisations and started the day in an assembly presented by All About STEM, who promote Science, Technology, Engineering and Maths in schools. They delivered a presentation to raise awareness about the benefits of apprenticeships and the different levels of study available. Breaking off into four groups, some students continued to work with All About STEM, learning how to navigate the government apprenticeship website. Students registered online with Find an Apprenticeship and began searching for current vacancies. Through this process, our students developed a clear understanding of the opportunities available to them after Year 11 and the application processes involved. In the workshop ran by the Department of Work and Pensions (DWP), students gathered together information to create the foundations for their first CV or enhance one they had produced independently. Students have previously worked with Alison from the DWP in group workshops learning the fundamental dos and don’ts of CV writing. This session gave them the opportunity to put their knowledge into practice and start thinking about the transferable skills they have acquired through school and extra curriculum activities. Manchester based training provider STEGTA joined the students to help them develop their employability skills and to provide a showcase of the engineering and construction companies they work with. STEGTA provide a variety of engineering apprenticeships for both national and international companies including ARUP, Cavendish and Wood. This interactive workshop focused on preparing students for the apprenticeship application process by developing students’ ability to communicate their strengths to employers in writing and in person. 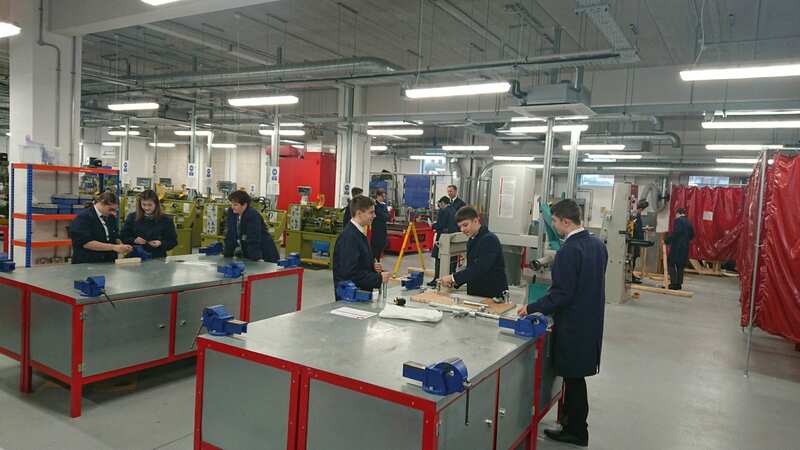 In the workshop, students were put to the test with different problem solving activities, based on the types of challenges used by engineering companies like Siemens and Jaguar Land Rover during their apprentice assessment days. Using their creative and analytical skills, students were asked to complete challenges such as; balancing twelve nail heads on one nail, following a diagram to put together a selection of pipes and building a free-standing structure. These activities are designed to see how potential employees work together in a team and how they collaborate to find answers. They enable companies to evaluate people’s personalities, assessing how people develop relationships with others, what roles people take on within a team and whether they would suit working with the existing team at a company.